If you’re investing in a new roof, it pays to look toward the future. Obviously, you’re experiencing troubles with your current roof. Whether it’s leakage, ineffectual protection from the elements or something else, looking to the future means taking steps to ensure that your roof construction goes off as planned, without compromise. While you can place your trust in the company – or contractors – that are constructing your roof, having a third party on site to observe the process ensures the integrity of your project and, more importantly, contributes to a longer lasting, more reliable build. In this post, we’re going to look at the role that roof construction observation plays in your building’s future. Staying true to your original design specifications is essential. Your architect designed your roof to include specific elements, features and qualities… if your construction crew doesn’t adhere to these specifications, you run the risk of your roof falling short of your expectations. The primary goal of your roof is to provide protection. 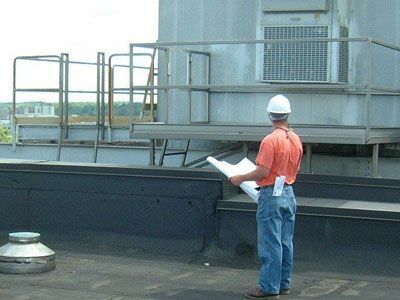 Your building’s inhabitants and the products that it houses are critical to your business and, as a result, ensuring that your roof affords those things maximum protection should be the number one priority of the construction process. Over time, projects that utilized “shortcuts” that would have been caught by a third-party observer begin to wear down. Shorter lifespans and lessened protection mean that you may need to replace your roof sooner than anticipated. At Wharry Engineering, our third-party construction observation services have been shown to increase the lifespan of our customers’ roofs by as much as 40%. Allowing our clients to save substantially on repairs, maintenance and replacement, we stand behind our process. If you’ve been considering a roof replacement and want to be confident in the long-term integrity of your new roof, contact us today to discuss how we can be of assistance.